Honourable Minister of Finance presenting the budget for 2015. The 2018/2019 fiscal package, which included measures to bring more stability to the economy, including the momentum for more growth, was presented during a meeting of the Legislative Assembly at the Montserrat Cultural Centre. 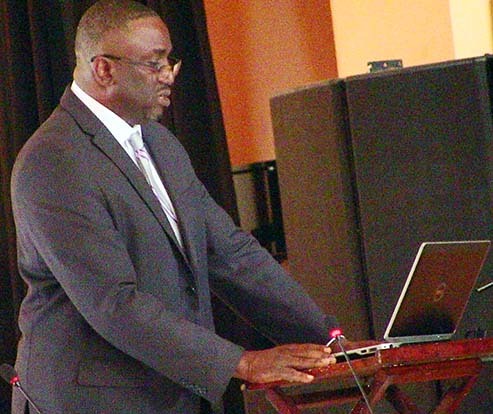 The Budgetary proposals gave meaning to the projections Premier Romeo outlined in the Estimates of Revenue and Expenditure, with projected economic growth of 2.22 per cent during 2018/2019, and the government’s aim to achieve sustainable growth of around 3 per cent to 5 per cent per annum over the next ten years. The budget presentation also highlighted increase in capital and recurrent expenditure for this fiscal year. The capital Expenditure programme has been increased to EC$33.62 million (EC$7.14 million DFID-funded Projects, EC$24.58 million EU-funded projects, EC$1.90 million other funding partners), compared to the EC$14.95 million sent n 2017/2018. The recurrent Expenditure for the 108/2019 financial year is EC$131, 151, 300 representing an increase of 2.16 per cent over last year’s figure. Efforts aimed at economic diversification and employment creation to ensure self sustainability, a number of sectors were poised, according the Premier Romeo, for growth over 2018/2019. The sectors highlighted by Premier Romeo include Port development, the mining and quarrying sector, Agriculture, the construction sector, hotel and restaurant segments of the tourism sector and the continued growth of the festivals. This is expected to result in increased tourist arrivals. The revenue projections for this fiscal year also show an increase compared to 2017/2018. The revenue estimates for 2018/2019 is EC$131.15 million compared to EC$124.2 million for last year. The budget debate is scheduled for Thursday 9.AM.